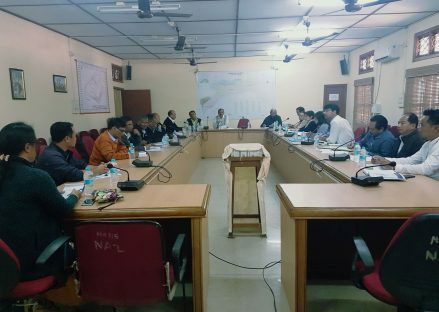 Changlang, November 29, 2018: The Second quarterly DLCC, SLMC & DLRC Meeting of Financial Institutions was held at Changlang Deputy Commissioner’s Conference Hall under Chairmanship of Deputy Commissioner R.K Sharma. The meeting was attended by Chief Manager Lead Bank Dibrugarh, ADM RBI, Administrative Officers S.S Chaudary ADC Jairampur, R. Karlo EAC Miao, Dr Rani Mibang CO Changlang, Nobu Chader CO Changlang, Bank Managers of SBI & Apex Banks Changlang, Jairampur, Miao, Bordumsa, Diyun, Kharsang, and other Heads of Departments. Some of the vital issues discussed during the meeting were review of credit flow up to the quarter ending 30th June 2018, discussion on schematic progress on various government sponsored Schemes like KCC, PMEGP, MUDRA, CM Krishi Rinn Yojana and Bunkar Yojana, recovery of government sponsored loans, Bakijai Cases and progress on various Social Security Schemes such as PMJDY, PMSBY, PMJJBY, APY, conducting of Financial Literacy Camps and Aadhaar Seeding. Deputy Commissioner R.K Sharma stressed on initiating recovery measures from the Banks by issuing notices to defaulters for recovery and Bakijai cases for which the Administration is ever ready to cooperate for effective recovery of Loans. He directed the Banks to sanction all government sponsored loans expeditiously for achieving their Annual target and conduct Financial literacy Camps in all Circles for extensive Coverage. Regarding Security issues, the DC advised to install CC TVs at vital Locations, install ATM Booths wherever possible and operationalization of Customer Service Points and e-Corners for benefit of the Public. He further directed all Banks to mandatorily submit monthly progress on CSPs to the GM, Lead Bank for monitoring & assessment.